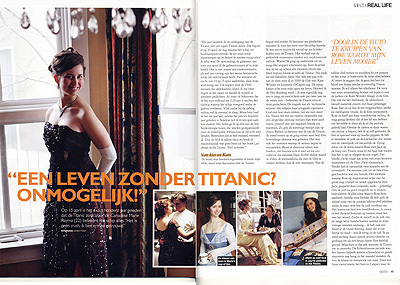 In March 2012 a journalist with the Dutch magazine Grazia contacted me about being interviewed for a feature on the 100th anniversary of the sinking of the Titanic. We did an interview and a photoshoot, and the article was released in The Netherlands in early April. The original article is in Dutch, so a family friend translated it for me. Here's the spread and the article in English. A life without Titanic? Impossible! On April 15, it's exactly 100 years ago that the Titanic sank. For Canadian Marie Rayma (22), the ship means everything: "It's not a crush, it's like I'm married to it." I commemorate the demise of the Titanic each year with my own Titanic week. The week begins on April 10th, the day that the ship left Southampton. I put on my white sailor's hat and relive the maiden voyage as if I was really there. The excitement, the glamour, all the events replay in my head hour by hour. It's not really a memorial service, but more a celebration of the most fantastic ship that ever existed. My mood only changes on the eve of April 14th. I dress completely in black for two days out of respect for those who perished and during these days I wallow in somber thoughts. But I must confess that I don't really maintain that state of mind until 2:20 am, the time that the disappeared forever beneath the waves. I usually fall asleep shortly after the ship hit the iceberg. Maybe I'll stay awake until the final moment this year, because it's exactly 100 years ago (that the disaster happened). In any case, I want to make something special of this (year's) occasion. I would love to go on one of the commemorative cruises that are sailing to the site where the ship sank. Unfortunately, I can't afford a trip like that. Also, I suspect that these are massive cruises (with very large numbers of people). So I'll stay home and will probably cook myself a meal from the cookbook 'Last Dinner on the Titanic'. Very intimate. I have been celebrating "Titanic Week" since I was eleven years old, but my fascination with Titanic started a lot earlier. I remember clearly when I first heard about the ship. I was six years old and happened on a children's book about Titanic. The story of the famous ocean cruise made a big impression. Wow! I started to look for information and absorbed every snippet. When I was seven years old, we had to make a floating object of clay at school, so I made the Titanic of clay. But it sank like a brick, ha! But when I saw the 1997 movie with Kate Winslet and Leonardo di Caprio, there was no more holding me back. The disaster came to life in front of my eyes. Although I found the movie very scary – I was really a bit too young and was only allowed to watch it two years after it was released – the Titanic dominated my thoughts from then on. The tragedy of this 'technical miracle' that, according to her arrogant owners, God couldn't sink, would never leave me. I found it especially compelling that people show their true character – positive or negative - during catastrophes of such a scale. I was equally crazy about Titanic at the time as some girls are about Justin Bieber right now. It dominated every minute of my days and became a life-long obsession. This was also the moment that I started to seriously collect. Before this time, I only possessed a few books, but it quickly grew to a collection that is worth nearly $10,000 at the moment. And I certainly can't resist any movie memorabilia: all the different DVD versions, posters, and the script in book-form, I have to have it all, but I'm not a fan who buys anything sight unseen, just because the word "Titanic" is printed on it. I only want the best. The core of my collection is a set of replicas of Kate Winslet's dresses, I cherish those, because I really identify with Rose. Just like her, I am a strong, free and intelligent woman. In the movie, Rose liberates herself from her suffocating life; I'm only hoping I would have the same guts as she, had I lived in the same time period. Because the dresses were too expensive to buy, I made them myself. I took sewing lessons just for this purpose. I have a couple of them: the dress of the lunch scene, three versions of the 'swimming dress' and of course the 'flying dress' from the scene in which Jack and Rose are on the bow of the Titanic and where he lets her feel what it's like to fly like a bird. It sounds very cliché, but that's one of my favourite moments from the movie. Sooooooooo romantic! And then I have two copies of the ball gown / evening dress, the most beautiful dress of all of film history, as far as I am concerned. That moment when Rose majestically descends from that big staircase and Jack, played by Leonardo di Caprio, waits for her at the bottom of the steps, ooooh…. Fantastic! In order to remake the dress as close to the original as possible, I studied the every scene in which Rose wears the dress, frame by frame. I have even studied deleted scenes from the extended edition, so that I knew exactly how the dress was put together. It was very difficult, I had to sew on at least 1000 sequins but it was worth it. As soon as I put on the dress, my vintage jewelry and my white gloves (I also have a 'Heart of the Ocean' necklace, although that's really a bit too much), I feel that I travel back in time. I become taller, speak more clearly and behave like a real lady. A wonderful feeling. Maybe that's why Titanic continues to attract me. The Edwardian period was the last period in which beauty and manners were still considered very important. I miss the class and romance of those days. Our family home in Calgary happens to date to 1912, and that reinforces that nostalgia. My room at home is totally in the atmosphere of a first class suite on Titanic. I have only antique furniture in it; my prize possession is a dressing table that looks like the one Rose has in the movie. I really enjoy sitting at my dressing table and observing myself in my hand mirror while brushing my long hair. By the way, I wash my hair not very frequently, just like they did in those days. That isn't yucky, your hair gets used to it. The fact that I identify with Rose doesn't mean that I have completely lost contact with the present day, but it softens the coarseness and high-stress atmosphere of today. It makes my life more beautiful. When I think about it, Titanic has enriched my life in many ways. It's because of Titanic that I decided to become a graphic designer, because I wanted to make my own Titanic website (make-it-count.org), where I could share my passion with others. The soundtracks of the movie also mean a lot to me. I still listen 15-20 hours per week to the music, also at work and I sing along with all of it. The music supports and never bores me. I know exactly which song to play in order to get me in a better mood. And Titanic Suite is my alarm, it takes 20 minutes, so I can't sleep through it, ha! I just got the Collectors Anniversary edition in, consisting of 4 CDs, what a day! That whole weekend was a complete Titanic haze. But at the same time, it's also sometimes difficult. Sometimes I feel lonely because I have never met anyone else who is so obsessed with Titanic as I am. I visited the traveling Titanic exhibit four times, but it was never long enough! What I would have really liked to do is spend hours and hours observing all the objects that were recovered from the wreck and getting all teary-eyed about it, but the family members and friends who accompanied would get bored quickly. Too bad. Everyone I know knows that I am obsessed with Titanic. In high school I was known as the Titanic girl. I had a cell phone number that ended in 1912, so when my friends would see that number, they'd know instantly 'oh, there's Marie'. But they never teased (bullied) me. My sailor's hat was occasionally stolen during Titanic-week, but that's about it. At work too, my colleagues do not judge me. Of course, sometimes they're sick of listening to my Titanic tunes and then they tease me. But most of them are used to it. They have to be, because I'm not changing. I told the same to a girlfriend with whom I was celebrating Titanic week when we were in Australia. 'Can't you take that hat off' she begged me 'you're embarrassing me'. So, no. I only took it off when we went scuba diving. My honouring the perished victims is more important than what the people around me think of me. So I demand that others have respect as well. I did learn to dampen my enthusiasm a bit. I'm a bit less irritating than in the past. My parents also told me: 'a bit less, sweetheart, you'll just alienate people'. I went to see the special preview of the 3D version of the movie on Valentine's day. It was the very first time that the 3D version was shown in movie theatres. I was just hyperventilating because of all the excitement during the first 15 minutes, that's how realistic it was. But afterwards I was dehydrated because of all the crying – I nearly fainted. That's why I have seen it only 50 times, of which 30 times not completely. Sometimes I need a Titanic-shot, but not at the expense of everything else. The movie doesn't just cost time, it takes a lot out of me emotionally. After the movie I am completely exhausted. So, ok, I've seen the movie so many times that I know all the dialogues by heart and I can visualize the entire movie in my head. I close my eyes and it begins. But yet I relive the whole story completely every time I see it. And every time I see the movie, I hope the ship won't sink. When the crew tries to steer the ship away from the iceberg in desperation, I cheer them on: you can do it! What dreams do I still have? I'd like to reproduce the original first class Vinola-soap. I am currently researching how to do that. But at the top of my list is a holiday to the UK, where I'd like to visit every place that has any connection with Titanic. From the dock where she was built to the old main office of the White Star Line. With a bit of luck, I'll go at the end of this year. And although it's very expensive, I'd love to return by ship. How cool would that be – to travel the same transatlantic route as Titanic. But I do hope I'd get to the other side alive and well!